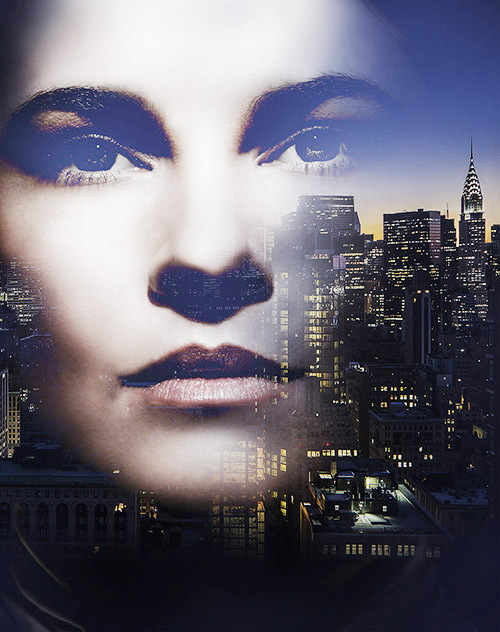 This image is a composite of three layers -- one is the city, one is the woman's face, and the third is a flat layer of deep blue tone that I allow to bleed through in various areas. The bottom layer is the city. The top layer is the woman's face set to "Lighten" mode and also with a layer mask where I could paint out various sections. The middle layer was the flat color that I also painted out in various spots to increase or eliminate the color. The color in woman's face was also desaturated a bit.